Spectacle in the Boston Harbor just opened last week to the public for the first time in decades. It used to be a trash dump. Now it boasts a nice small beach with lifeguards on duty, a good view of the Boston skyline and other nearby islands, and many comforts. A brand new building has an exhibit about the Island, restrooms, a snack bar, and rangers to answer questions. Large Adirondak style rocking chairs sit on the porch overlooking the new pier. There are lots of hiking trails that I will explore on a further visit. My cell phone had excellent reception on the Island. The Harbor Express round trip price was $12. The boat was 45 minutes late to pick us up which did not bother me much, although one lady was becoming out of control abusive towards everybody she could find to listen. Most of us, I think, had a very nice excursion to Spectacle. It is bound to become more crowded and popular in the future. Some scheduling mistakes in the second week of service are bound to arise. I plan to return soon. The four member early music ensemble was accompanied by Michael Barrett tenor and recorder player last night. They performed the music written by seventeenth century expatriate Englishmen. Daniel Meyers on the bagpipes was a treat. We were provided with the lyrics to the songs and Barrett deviated considerably from the text. Still his performance was spirited and well executed. I would highly recommend a concert of the group Seven Times Salt. My generous friend not only treated me to the concert, but also a CD by the ensemble, and a tasty dinner. On Brattle Street in Cambridge, just outside of Harvard Square, is a large yellow mansion where George and Martha Washington stayed during the siege of Boston 1775-1776. The British troops were finally ejected from the town and the Washingtons left soon after. The poet Henry Wadsworth Longfellow was born in Portland, Maine in 1807. Thirty years later he accepted the professorship of modern languages at Harvard and moved into the House now named after him. At first as a tenant and then owner, he lived in that house for the rest of his life. Longfellow's maternal grandfather, Peleg Wadsworth, served under George Washington. 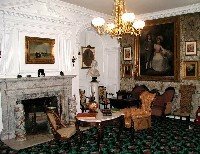 Longfellow really wanted to live in the House occupied by General Washington and at first even slept in the same bedroom that the general had occupied. Longfellow wrote so many very popular poems in the house including Cross of Snow, Song of Hiawatha, and the Children's Hour. Charles Dickens visited him in that house twice, once in1842, and the second time in 1867. Longfellow was curious about Walt Whitman's free style of verse and did meet him once as well. Longfellow was opposed to slavery, a proponent of women's education, interested in the plight of the native American, and it seems a very sentimental man. He outlived both of his wives. His oldest daughter Alice was one of the founders of Radcliffe College, which at that time was called the Annex of Harvard. Alice never married and lived in the house until her death in 1928. The House was well staffed today. As I walked up to the main entrance I was greeted by a ranger. In the garden another ranger was trimming the shrubbery and I chatted with her. The rangers are doing research so that they could restore the gardens to much what they were like when Alice tended them. I was the only person on my tour. The guide has been there for several years and I had taken one of his tours before. He recites lines of Longfellow's poetry in every room and obviously thinks that the poet was a great man. He even offered to answer more of my questions after the tour was finished one hour later. It was a very enjoyable afternoon activity. After work I visited the Fogg Art Museum. It is one of my favorite destinations. There I saw an erudite docent who also attends conversation groups at the French Library. It is always a pleasure to talk about art with somebody as knowledgeable as her. She knows the collections at the Fogg and Sackler Art Museums at Harvard very well. We both enjoy their paintings by Ingres. She recommended that I request to see some of his works on paper at Harvard's Mongan Print Center. After chatting with her I admired the temporary exhibit American Pastels and Watercolors 1875-1950 for the sixth time since it opened in April. June 24th will be the last day that it will be on display. The only temporary exhibit that I liked better at the Harvard University Art Museums was the Degas at Harvard. That was spellbinding. Too many people go to the blockbusters at the Museum of Fine Arts and never visit the Harvard Museums. They do not know what they are missing. La Donna Musicale performs music mostly composed by women. This was the second concert in the SoHIP series that my generous friend has treated me to this summer. My cultural life is much richer thanks to him. La Donna Musicale performed baroque music including compositions by Elisabeth Jacquet de la Guerre. Their sound was excellent, better than the Newton Baroque that we heard last week. The Museum of Science has not changed that much in the last three years. We walked by the area with live butterflies. It looked like an interesting experience, but I had been in the butterfly part of the Franklin Park Zoo several summers ago. They have a theater with 3D movie shorts, but we passed on that too. The new exhibit on predicting weather was well done with Mish Michaels from CBS4 News in many of the video clips. What really interested me were the walkabout gliders. A volunteer makes gliders fly across the room simply by creating an updraft with a plexiglass sheet. There are no moving parts. He walks underneath the glider with a sheet of plastic which generates air currents that keeps the planes afloat. As if that were not impressive enough, he has modified dead butterflies so that he can make them appear to fly across the room. He gave me the chance to keep a foot long glider in the air. After a few tries and a lot of running around, I was able to keep it up in the air for awhile. It was very good fun albeit a little tiring. He has a pilot license and he flies gliders, so he knows a lot about flight and lift. I had not been in a sailboat for nearly twenty years and I wondered if I might tip it over. The boat was very small. My buddy has years of experience volunteer teaching sailing, and he did a good job of building up my confidence. For only a minute or two I held the tiller, but that was fine for today. It was a lot more fun than I expected it to be. Some of the basic terminology began to come back to me. The exhibit at the Museum of Fine Arts, River of No Return, is certain to be a crowd pleaser. The label copy would lead one to believe that it was more provocative and controvertial than it really is. Rather than it being a shocker or providing a jolting experience, it conveys the natural beauty of central Idaho. The very large photographs are very clear and were not digitally made or tampered with. It features just what I would expect of the West; hunting, fishing, farming, mountains, mining, panning for gold, a wildfire, a Native American, and an eighth grade girl in many poses who never smiled. I didn't see the controversy. This is how some people live, work, and feed themselves in this rural area. It is easy for us city dwellers to be self righteous about our lifestyles, but we rarely have to worry where our next meal is coming from or how we could possibly scratch out a living when there are absolutely no jobs. I loved the beautiful photographs and the respect with which Ms. McPhee treated her subjects. There were many pictures of a girl named Matte, one in which she wore her grandmother's wedding dress. No smile but such interesting and hard to read facial expressions. Matte had a deadpan look as she posed holding a large live turkey upside down. In another she held a bird by its wingtips. She also posed alone in her school bus. The genius of the picture was in the angle at which it was taken. The Sawtooth Mountains make a lovely backdrop for many of the pictures. It is an exhibit that I would like to see several times. Laura McPhee is a professor just a few blocks away at the Massachusetts College of Art. She made very good use of her two year sabbatical in Idaho. The Society for Historically Informed Performance features concerts during the summer, when most concert series are over for the season. They are held in a local church and fans are passed out at the beginning of each performance because the heat can become oppressive. Newton Baroque performed concerti inspired by a composer that is not well known in the West. Johann Georg Pisendel (1687-1755) was the concert master of the orchestra for the court of Dresden. He was well liked and respected by his contemporaries including Telemann, Vivaldi, and J.S. Bach. The Newton Baroque chose pleasing music by these composers. Their performance was competent but not inspired. Some of the other ensembles performing in the SoHIP series this summer have a lot of experience and a very polished sound. Hopefully my generous friend will invite me to some more concerts in this series. He is a real early music aficionado. I cannot remember him complaining about any concert that we have attended. He always applauds with great enthusiasm.